2. If you enjoy sewing Julie over at Vintage with Lace, has a beautiful vintage look by sewing lace hearts. These can be of any size large or small. You could even use vintage doilies to create this look. 3. Do you have a vintage drink crate or wooden box? If so, it is time to put it to good use. Take a peek at what Color and Crafts did with a simple crate. This type of table scape can be done in red, white, or even a mix of both colors and you will have a great vintage Valentines decor. 4. 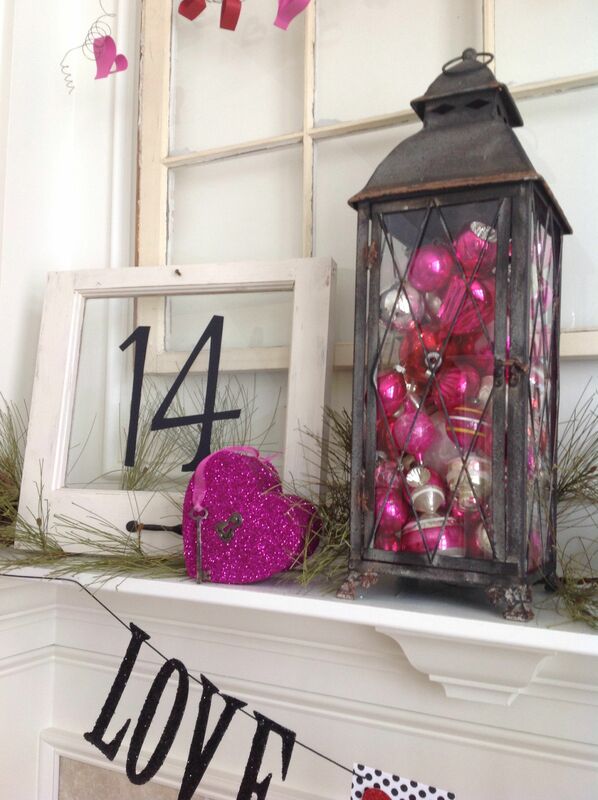 Want to include your mantel in on the Valentines decor? With just a simple wood frame, a lantern (maybe hanging around from Christmas), some beautifully colored vintage Christmas ornaments, and you are on your way to a great looking mantel. Rebecca Neft has done a great job with this idea. 5. Do you have some vintage keys lying around with no real purpose. Put those beauties to work and create something beautiful for your Valentines decor. A key to my heart sign is a perfect display piece. Love Griswold gives all of the details to create this sweet decor. 6. A basket full of vintage and maybe even rusty hearts and heart cookie cutters is another easy Valentine’s decor idea. Villabarnes nailed it with this display…rust n all. 7. Got a vintage heart-shaped baking pan just sitting around with nowhere to shine. No worries tie some ribbon to that beauty and hang it on the front door. 8. If you are a lover of antique and vintage typewriters and have one on display in your home. Put that lovely to good use and let is come alive with a Valentine’s message. Vintage and Laces has shown a beautiful vintage Valentine’s Decor and the type set just pulls it together. 9. You have been looking for the right opportunity to show off those great red and white enamel ware pieces. Well now is your chance, put that vintage glam on display for a great Valentine’s decor display. It doesn’t matter if you have just a few pieces or a whole wall full, HappyLovesRosie.Com and got it down. 10. Want to blow your Valentines decor right out of the water? 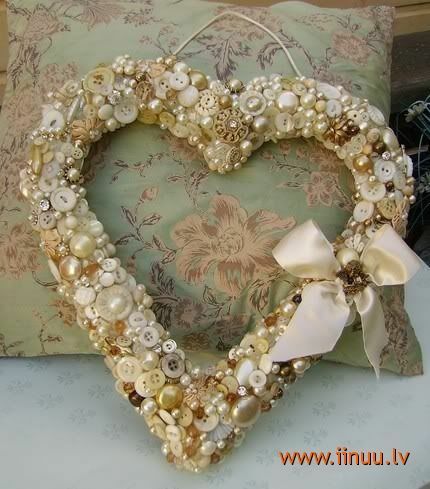 If you love buttons and have a great stash of vintage buttons, grab a heart shaped styrofoam wreath form like show in this Pinterest photo and you are golden. I hope this has given you some great ideas to help put easy vintage items into your Valentine’s Decor. Do you have a vintage Valentine’s decor idea?